Can I tell you a secret? I don’t really like turkey. I know, how unpatriotic of me – Benjamin Franklin is probably rolling in his grave! I love Thanksgiving, but for me the real stars of the “Turkey Day” feast are the side dishes (and maybe also the prime rib that my family usually has for Thanksgiving dinner). A friend of mine requested that I post some of my favorite Thanksgiving-worthy recipes, so here goes! This week, I’m doing a series of five side dishes – some vegetarian, some not – in order to hopefully inspire you all to make something equally simple, gourmet, and delicious for your Thanksgiving meal. I’ve chosen recipes that provide a somewhat new or unique twist on Thanksgiving classics, such as roasted vegetables, casserole, mashed potatoes, and stuffing. Keep checking in this week to see what I’ve come up with, and I hope you enjoy it! 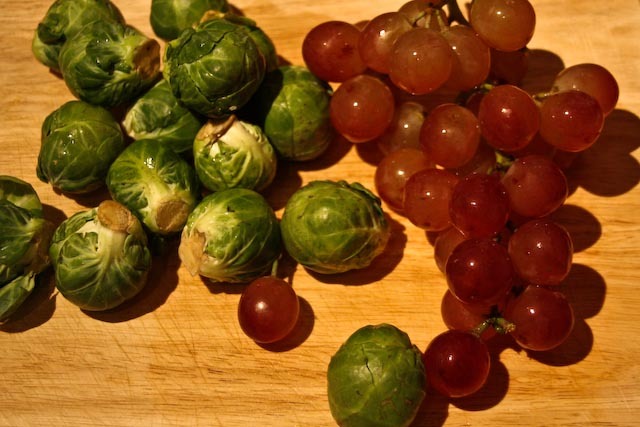 Thanksgiving Sides: Part 1 – Brussels sprouts with bacon and grapes! Now, I hated – hated! 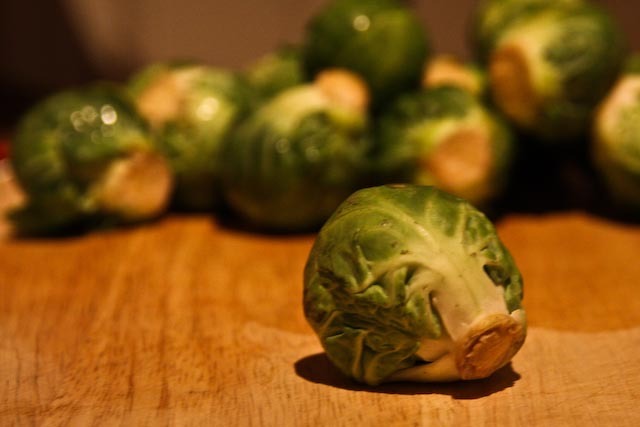 – Brussels sprouts when I was a kid. 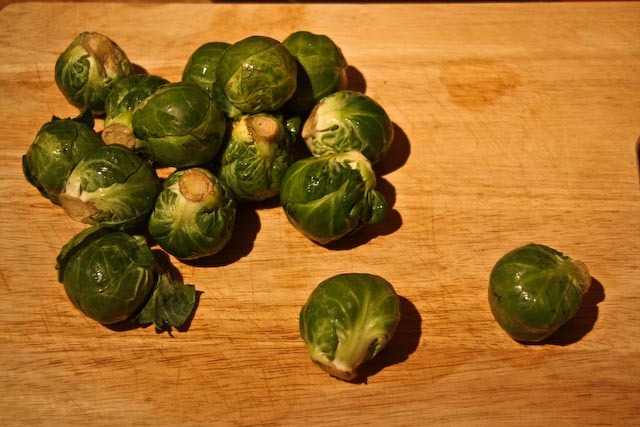 But for whatever reason, I love them now – especially when roasted with lots of salt and pepper, and even better if they’re cooked with bacon! 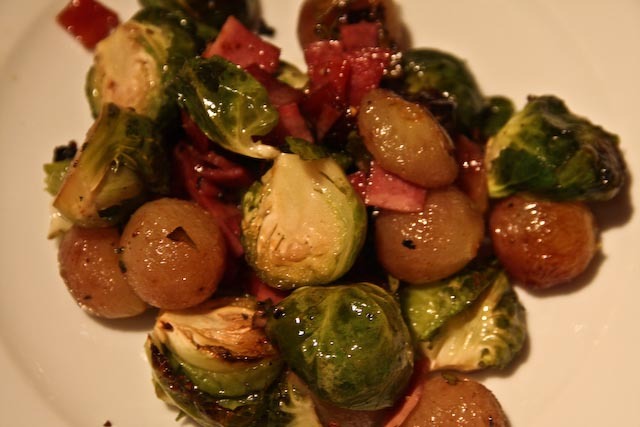 I think the mixture of grapes, bacon and Brussels sprouts makes for this awesomely salty slightly sweet medley that is a great accompaniment to any meat dish or along with other vegetarian sides. You could easily make this dish vegetarian by nixing the bacon (gasp!) or by substituting it with a vegan or vegetarian alternative. I hope you enjoy my take on roasted veggies for Thanksgiving! Preheat oven to 400°F. 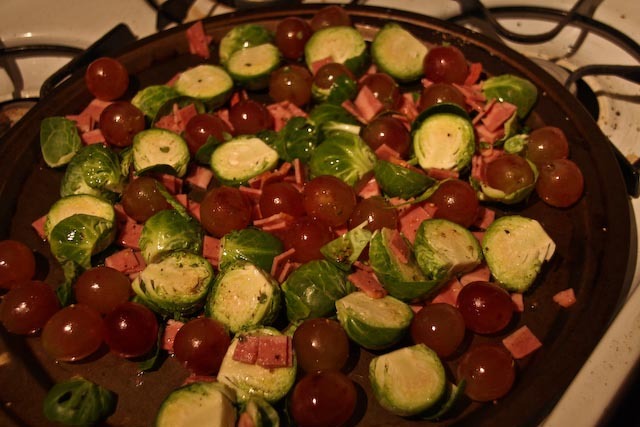 Spread Brussels sprouts, grapes, and bacon pieces out on a baking sheet. Season with salt, pepper and thyme, and drizzle with olive oil. Using your hands, toss the ingredients together to be sure that everything is coated with oil and seasoning. 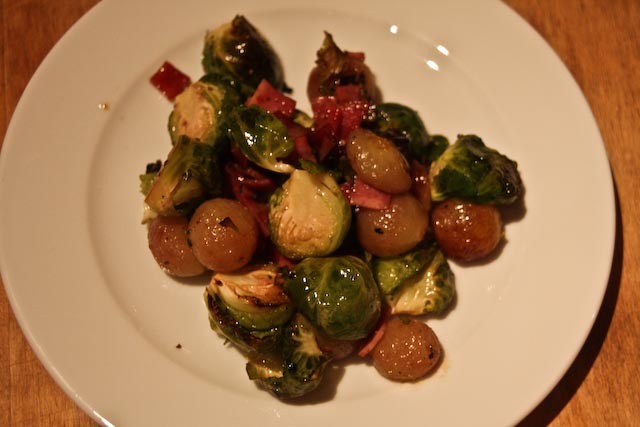 Bake for about 25 minutes, or until the grapes are tender, the Brussels sprouts are just browned, and the bacon is slightly crisp.